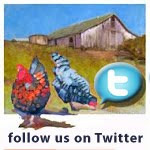 We had a fantastic day at Liz Daniel's "Cow Track Ranch" in Nicasio. It was the day after a gorgeous wedding had taken place, and many of the decorations and flowers were still in place. Liz was so accommodating, and we were still able to visit all the nooks and crannies of her property. I stopped at Nicasio Cheese Company on my way over, and purchased my lunch: a cooler of cheese, crackers, and drinks to enjoy through the early evening. While I was there, an entire family of cyclists had stopped in for a break. They were training for the Marin Century that took place the last weekend in August. I hope they enjoyed it! There were over 20 artists out at Cow Track throughout the day this year. This is one of the best spots to visit because it is easy to get to and there are so many unique things to paint. Holsteins, Long-horn cattle, rolling hills, old tractors and barns, a pond, lots of gardens and plants, rock outcroppings and more. Photojournalist and blogger, Ann Brooks, has written a terrific post on her day there too! 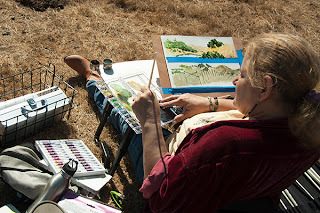 Please click here to view Ann's photos of the day, including this one of West Marin's, Sharon Skolnik-Bagnoli, painting watercolor sketches. Our next visit is August 19th, Creekside Gardens. We have another visit in August at the Lunny Oyster Farm. Please visit our Schedule to learn more about these outings for artists.